The Gradebot Gradebook is the most advanced Excel gradebook on TpT. It is also a lot more than just a simple gradebook. Gradebot self organizes and calculates important performance information for you on the health of your students. If you are person who believes that educating students requires more than just a “gut feeling” this is a perfect tool to help you gain an analytic prospective. This simple tool will save you time and money while helping you better understand your class’s health. Only a few steps are necessary for you to get started. Since it is used in Microsoft Excel it is easy for everyone to upload and get started. Just input your students into the roster page and they will automatically calculate into all other locations. After that it is a simple matter of inputting your assignments and grades as you would with your normal gradebook and the program automatically figures class and student averages and more. 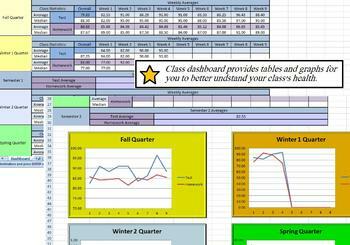 The Dashboard provides you with an upfront macro view of your students performance on a macro level. See how the class has performed every week since the start of the school year in both tables and easy to understand graphs. All this is provided automatically and updates every time you enter a new grade. The gradesheet is the same as any standard gradesheet where you can input all your student’s assignments and tests as well as all grades on a single sheet. However, it also gives immediate information such as class average and individual student's averages on assignments and tests.